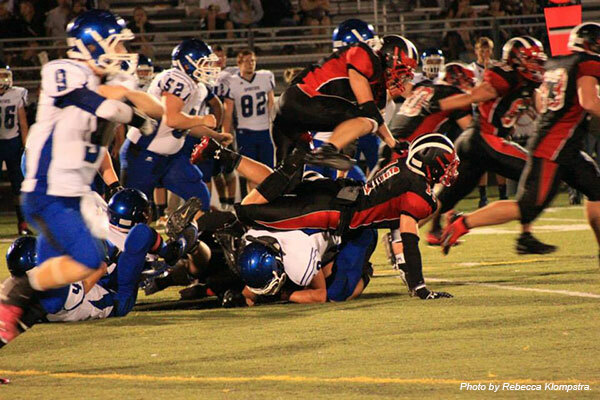 LET’S GET PHYSICAL—The Cedar Springs Red Hawks dominated the Spartans last Friday night in a 49-13 win. The Cedar Springs Red Hawks Varsity football team hosted the Sparta Spartans at Red Hawk Stadium on Friday, September 6. The Red Hawks achieved their second win of the season defeating the Spartans 49-13. The team is now 2-0 after defeating Tri-County and Sparta. “We keep getting better and I’m pleased about that, but we have a long way to go,” commented Coach Kapolka. Cedar Springs’ offensive line was strong against the Spartans. In the first quarter, Senior Cameron Link ran eight yards for a touchdown. Senior Jeff Newland also ran eight yards for a touchdown and in the second quarter, Junior Kaden Myers ran the ball nine yards for another touchdown. Sparta’s Shane Miedzielec also scored, on a 20-yeard pass from Christian Pangborn. The score at halftime was 28-7 in favor of the Red Hawks. In the third quarter, Cameron Link ran for a 51-yard touchdown and Jeff Newland followed with another six-yard touchdown run. Miedzielec scored again for Sparta, this time on a 58-yard run, but the extra kick was no good. Cedar Springs scored again in the fourth quarter, when senior Jared Vodry dove into the end zone for a one-yard touchdown. The final score of the game was 49-13, in favor of the Red Hawks. The Cedar Springs offense put up some impressive scoring numbers against the Spartans. In the first quarter they totaled 20 points, followed by 8 points in the second quarter, 14 points in the third quarter and 7 points in the final quarter. The defensive line was also very strong for the Red Hawks. Kaden Myers intercepted a pass and scored a touchdown. Senior Cameron Klompstra led the defensive line with seven tackles and four assists, including a quarterback sack for 15 yards. Overall, the defense ended the night with 53 tackles, two quarterback sacks and two tackles, for a loss of four yards. Being 2-0 is a great feeling for Cedar Springs, but what makes it even better for the team is that they defeated their rival the Sparta Spartans! On Friday, September 13, the Red Hawks take on Wayland Union at Wildcat stadium at 7 p.m. The team is looking for their third win of the season so come out and support your Cedar Springs Varsity football team! The Cedar Springs Varsity Red Hawks ended their season with a 5-4 record. Photo by R. Klompstra. Friday, October 21, was a night filled with hopes of making it to the playoffs again for the Cedar Springs Red Hawks, but their rival, the Sparta Spartans, fought hard to ensure that it would not happen and outscored the Red Hawks 17-7. The first quarter was truly a battle with both teams not allowing the other to score. As the 2nd quarter went on, the ball moving again back and forth, it was Sparta that was able to score the first points of the game. With 1:20 left in the second quarter, Cedar Springs was given the chance to tie the game when Brandon Slater picked off a pass from the Spartans quarterback, but they turned the ball back over to Sparta on downs. The 3rd quarter looked promising for the Red Hawks when Jason Vietti recovered a Spartan fumble, but the Red Hawks then fumbled the ball and Sparta recovered it and took it in for another touchdown, bringing the score to 14-0 Sparta. The Red Hawks weren’t stopping though and answered Sparta’s touchdown with one of their own when Connor Burrows barreled through the D-line of Sparta, ending the 3rd quarter 14-7 Spartans. The 4th quarter was a tense one as the Red Hawks fought to keep their hopes of a playoff game alive, and Sparta fought to keep the Red Hawks out. The Spartans kept the lead by intercepting a pass and taking the Red Hawks out of scoring position. The Spartans then kicked a field goal to extend the lead to 17-7. The Red Hawks did what they could but fell short. Jason Vietti led the defense with 8 tackles and 3 assists; Cory Wozniak had 5 tackles and 2 assists; and Brandon Slater and Allen Slagter both had 5 tackles and 1 assists. Connor Burrows led the offense with a total of 89 yards and Austin Wamser with 71 yards. The Varsity Red Hawks bounced back from a loss last week to clinch their 5th win of the season against the Redskins of Belding. It wasn’t easy with the Red Hawk injury list growing. The Red Hawk offensive started strong in the first quarter scoring the first points of the game, after moving the ball down the field and then Austin Wamser sweeping in the last 2 yards for the touchdown, and then completing the pass from Tyler Covell for the 2-point conversion. Belding was looking good as well on their first possession, moving the ball toward a touchdown, when sophomore Red Hawk Cameron Link intercepted a pass from the Redskins, ending the first quarter 8-0 Cedar Springs. The second quarter, the Red Hawks continued to battle the Redskins as they both fought to score, but it was the Redskins that would score and tie the game 8-8. Cedar Springs was able to turn around and score again, when Tyler Covell passed right to Ike Golczynski for a Red Hawk touchdown, and then added two more on Tyler Covell’s pass to Austin Wamser, bringing the score to 16-8 Red Hawks. The Redskins weren’t going down that easy though, and answered with a touchdown of their own with only 29 seconds left in the half, ending the half 16-16. The Red Hawks defense didn’t give the Redskins much room to move the ball in the third quarter. Red Hawk Jason Gingrich intercepted a Redskin pass, but neither team scored in the third quarter. The fourth quarter proved to be an exciting one as the battle raged, but it was the Red Hawk offense that scored again when Tyler Covell passed to the middle to Jason Gingrich for 14-yard touchdown. Up 22-16, the Red Hawks defense held strong and didn’t allow the Redskins on the board again. Cedar took it in for one more touchdown, when Connor Burrows ran up the middle with 2:03 left in the game. The final score was 28-16 Cedar Springs Red Hawks. Jason Vietti led the Red Hawk defense with 13 tackles and 4 assists, and Rylan Ash had 10 tackles and 1 assist. Dan Sagorski, Brandon Slater and Cameron Link all contributed as well with 8 tackles each. Offensively, Austin Wamser led the team with a total of 86 yards rushing, along with Connor Burrows who had 76 yards rushing. Quarterback Tyler Covell completed 10 of 18 passes for 126 yards, and Jason Gingrich led in pass receiving with 44 yards on 4 completed passes, and Ike Golczynski had 36 yards with 2 passes. Brandon Slater had 27 yards on 2 passes and Austin Wamser had 19 yards on 2 passes. The Red Hawks (2-2 conf, 5-2 overall) will travel to Grand Rapids to take on the OK-Blue conference leader West Catholic Falcons (4-0 conference, 5-2 overall) Friday, October 14 at 7 p m. Come out and support your Red Hawks! It was a hard night for the Cedar Springs Red Hawks as they faced the Panthers of Comstock Park last Friday, September 30, and fell to them 28-6. The Panthers came out showing claws in the first quarter, recovering a fumble from Cedar Springs’ first possession, and scoring the first points of the game. The Red Hawks were unable to answer, and lost senior Hank Porter to an injury. The ball turned back over to the Panthers, who were then able to score again on the Red Hawks. The Red Hawks held the Panthers the rest of the quarter, and ended the first quarter 14-0 Panthers. The second quarter proved to be as brutal as the first. Both teams fought to move the ball down the field, however, it was the Panthers who scored points, and ended the half at 21-0, Comstock Park. The Red Hawks regrouped in the third quarter, even after losing Hank Porter earlier and then Allen Slagter at the half to injury. The Red Hawk defense continued to hold the Panthers, while the offense fought the Panther defense and scored their only points in the third quarter. In the fourth quarter, the battle continued as the Red Hawks continued to fight down the field, but the attempts would not pay off, and the Panthers were able to score one last time ending the game 28-6, Comstock Park. “Our first play on our first offensive possession we fumbled the ball and three plays later we were down 7 nothing,” said Coach Busen. “After the kickoff we ran 3 plays for 30 yards and at the tail end of that third play Hank Porter got his leg rolled up on by a CP defender. Hank had to leave the game and I think that took some more wind out of our sails. We gave up two more scores before half and went in to the locker room down 21-0 and lost Allen Slagter to a concussion. Allen ended up leaving the game at halftime by ambulance. The second half we regrouped and had guys step up and fill in for Hank and Allen and we played much better but not good enough. The Red Hawks travel to Belding this week to take on the Redskins, and hope to improve their now 4-2 record. Come out and show your support. Good Luck Red Hawks! 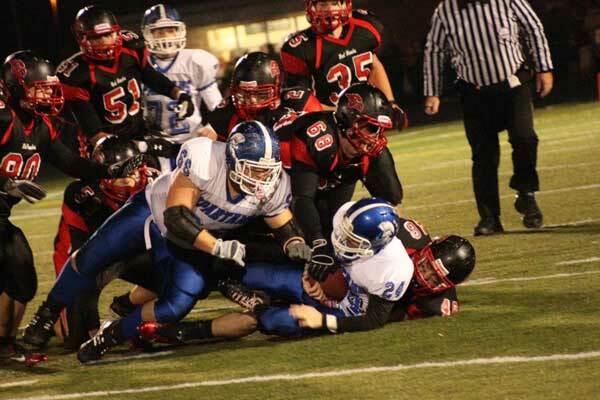 The Cedar Springs Red Hawks won against Forest Hills Northern for the second year in a row. Photo by R. Klompstra. Fans rocked Red Hawk stadium last Friday night when the Cedar Springs Red Hawks showed strength on the field and beat the Huskies of Forest Hills Northern 28-7, improving their season record to 4-1. The win was sweet, because it is only the second time since the Red Hawks began playing the Huskies in 1980 that they have beaten them. They played them every year from 1980-1999 (and lost), didn’t play them in the early 2000’s, and began playing them again in 2008. The Red Hawks have now won the last two years in a row. The Red Hawk defense started the game strong last Friday by not allowing FHN to move the ball down the field. The offense came out showing no mercy, scoring the first touchdown of the game when Austin Wamser ran a reverse for 21 yards. Both teams fought hard the rest of the quarter, ending the first at 6-0 Cedar Springs. The second quarter appeared to repeat the first as CS defense continued to hold FHN offense off, and the CS offense scored again when Hank Porter ran it in for another Red Hawk touchdown. The Red Hawks went into the half ahead 14-0. In the third quarter, the defense again did not falter. They held the FHN offense and pushed them close to the Red Hawk endzone, forcing them to punt it off. But Allen Slagter blocked the punt, sending the ball bouncing into the Red Hawk endzone and then picked it up for another Red Hawk touchdown! The third quarter ended with the Red Hawks on top 20-0. In the fourth, FHN was able to recover a fumble and run it down the field to score their only points in the game, but their scoring was answered by the Red Hawks when Conner Burrows ran into the endzone, bringing the score to 28-7 Red Hawks. The Cedar Springs Red Hawks will host the Coopersville Panthers this Friday at Red Hawk stadium at 7 p.m.
Last Friday night was a blow to the Cedar Springs Red Hawks, when they fell to the Broncos of Coopersville 28-13, bringing their winning streak to an end and their record to 3-1. The Red Hawks looked strong in the first quarter, scoring the first two touchdowns of the game. The first came when Hank Porter swept in for a 3-yard touchdown and the second when quarterback Tyler Covell’s pass was completed to Allen Slagter, who then ran the remaining 9 yards for the touchdown. That would be the last that Cedar Springs would make. The Broncos came out strong in the second quarter, scoring two touchdowns of their own, ending the half with a score of 14-13 Coopersville. The Broncos continued their rally in the third quarter with another touchdown, again unanswered by Cedar Springs offense. The defense did all they could to hold them to one touchdown in the third and fourth quarters. The fourth quarter continued to be a struggle for the Red Hawks as they were unable to answer another touchdown by the Broncos. The Red Hawks will host the Forrest Hills Northern Huskies this Friday at Red Hawk stadium at 7 p.m.